Home › Uncategorized › Ten day 4th of July forecast: Expired or canceled listing every 4 minutes across MA! 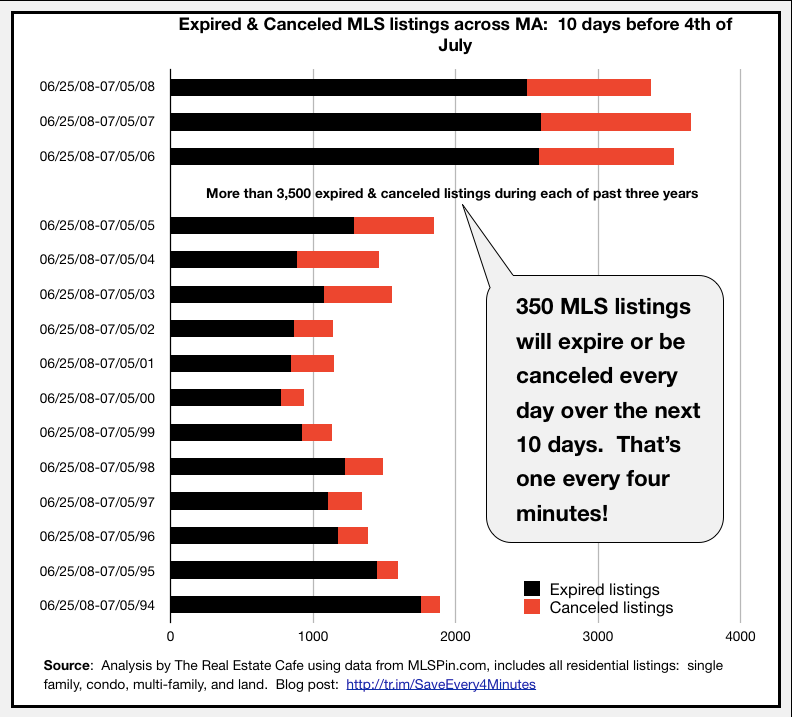 If recent trends continue, over 3,500 MLS listings across Massachusetts will expire or be canceled listings over the next 10 days (ending July 5, 2009). That’s an estimated 350 per day, or an amazing one every four minutes. What does that mean to real estate consumers? Home buyers, who have been timing the housing market, will be able to make offers directly to sellers at reduced prices; sellers can offer their homes at reduced prices and net the same profit. The ability to buy and sell without paying the traditional, two-sided real estate commission could bring some stalled transactions together, as stated in the blog comment below. Think of it as a “commission-free” holiday for home buyers and sellers. If you are a buyer, sign-up to received daily email updates of expired and canceled listings. If you are a home seller, we can help in two ways. First, if you are interested in selling “for sale by owner,” join one of FSBO seminars or visit our FSBO wiki. If you’d prefer to work with a listing agent, either traditional full fee or discount service, find out how our “Listing Agent Report Card” can help you select the most effective listing agent based on recent MLS statistics. Here’s what expired, canceled, and temporarily withdrawn listings have looked like across Massachusetts during June and July over the past 15 years, 1994 to 2008.